We appreciate that this won’t appeal to the vast majority of the finely honed athletes reading this, however if there is anyone out there who likes a well crafted beer, our friends at our favourite local beer shop, Stori, are hosting a series of ‘Meet the Brewer‘ evenings this Autumn/Winter. You can meet the brewer, learn about the brewing process and taste lots of lovely beer. All the breweries featured are from North Wales. 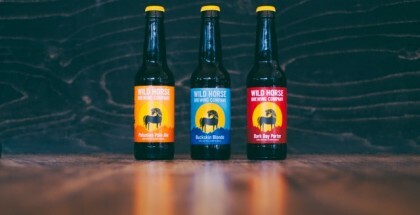 November focuses on the Wild Horse brewery from Llandudno (I recommend their Buckskin Blonde ) and December is our most local bragdy, Geipel, about 10 miles away in Gellioedd. We’re offering two free tickets to Stori’s Hop Circles in November and December when you book two or more nights at Ty Beic. The next one is on 2 December so get in contact with us sharpish to book your slot. Don’t forget that our local trail centres are rideable all year round so bring your bike and earn that pint. This entry was posted in Cycling Accommodation, Holiday Cottage, North Wales Holiday Cottage, Self Catering Accommodation and tagged beer, craft beer, cwrw, mtb, stori. Bookmark the permalink.